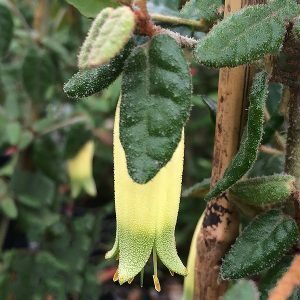 This is the most common form of Correa, and although Correa reflexa itself comes in a number of forms it is the low growing variety that is the most popular. 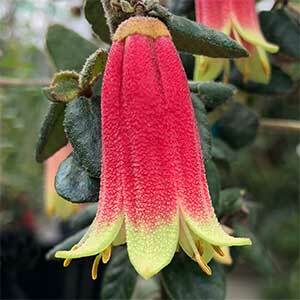 The most common form is a small shrub with red tubular shaped flowers with a green tip. Yellow and green flowered forms are also available. Prostrate forms, and larger shrubs that will reach to 2 metres in height are also found. This is a plant that is very attractive to nectar seeking birds and insects, and it will flower from mid winter though to spring. The reflexed tips on the flowers give it the name. Correa reflexa is another easy care native plant. A well drained soil is essential. A position in full sun will to light afternoon shade is suitable. When first planted, water well through the first summer. Mulch around the plant to maintain a cool root run and use a slow release native plant fertiliser once a year in early spring. Once established, little to no extra water is required if the area around the plant is kept well mulched. You can use this attractive little plant in the garden border, or you could grow it as a low hedging plant. Its root system does not interfere with drains so positioning is not a problem. It makes a great addition to a Mediterranean style garden. Regular light tip pruning is recommended, this will keep the plant in a bushy rounded shape, better and more flowers as well. The best time to prune is immediately after the main flush of flowers. Common Name – Native Fuchsia. Spread – Will spread to around 1 metres. Growth rate – Regarded as Medium to Fast. Flowering time – Winter to spring, although year round in ideal climates. Frost tolerance – Will tolerate light frosts.